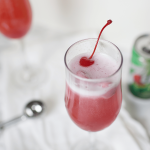 Cherry Sorbet Bellinis make the perfect easy party cocktail and punch idea for any party! Using 7UP®, champagne or prosecco, and black cherry sorbet, you can have a beautiful cocktail that’s perfect for sharing! Grab your champagne flutes and other supplies and set them out. You’ll want to make these drinks right before you need them as the sorbet will melt quickly. Use a mini scoop to scoop out 3 scoops of black cherry sorbet into your flute. Pour in 7UP until bubbles are halfway up the glass (about 2-3 ounces). Once bubbles have settled, pour prosecco until the glass fills up (you’ll have to wait for the bubbles to settle a few times before continuing to pour more). Top with 2 maraschino cherries and serve immediately. These bellinis are made to be served individually, but alternatively you could also make this recipe into a punch style recipe to be served at a party. Just increase the serving sizes and add to a large punch bowl with serving spoon!